Item #IGM-TPC-25: Lot of ten 1" assorted gemstone turtle pendants on 32" black cords. Item #AZ-20: 3.75"x4"x1" dark blue on gray Azurite turtle and lizards with green and reddish brown matrix. Item #CH24: 3.5"x2.25"x1" light green Chrysoprase sea turtles on brown matrix. Item #CH11: 1.5"x2"x2.5" medium yellowish green Chrysoprase turtles with slight matrix on brown matrix. 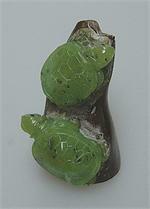 Item #CH15: 1.5"x3"x.75" medium green Chrysoprase turtles with slight matrix on brown matrix. Item #D&R-22999-E: 14Kt. Yellow Gold earrings with twenty fancy cut Golden Citrines of 1.19 Cts. TW, four round Diamond eyes of .01 Cts. TW and lever backs. Item #D&R-22999-P: 14Kt. Yellow Gold turtle pendant with twenty-four fancy cut Golden Citrines of 1.67 Cts. TW and two round Diamond eyes of .01 Cts. TW. Item #LG-1: Lot of one hundred, 5" long, assorted natural colors, Mexican Onyx Turtles. Item #LG-1: Lot of twelve, 5" long, assorted natural colors, Mexican Onyx Turtles. 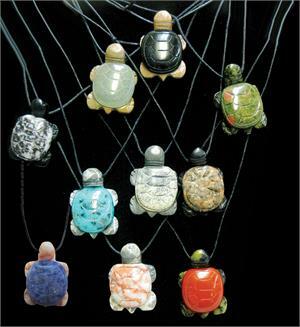 Item #LG-1: 5" long, assorted natural colors, Mexican Onyx Turtle. Item #GS-2016: 8"x6" tall Oregon Opal in matrix hatching turtles on white Coral on black Basalt base. Three carved green & gold Opal turtles and twenty-two eggs on front & back sides. 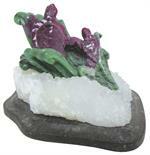 Item #GS-705: 3 1/2" x 2 1/2" x 7/8" tall; Carved from Peruvian Opal; Pink with Gray and Brown. Item #GS-2110: 3.5"x5.75"x1.25" Rhodonite Turtle in Matrix. Item #JP-H13: Approximately 6"-6.5" tall Serpentine Sea Turtles in Matrix; Mounted on a 2.75" Black Basalt base; Sculpture and size varies. Item #JP-H14-B: Approx. 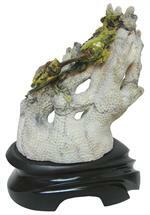 6.5"-2.5"-7" Serpentine sea turtles in matrix mounted on a 2.75" black basalt base. 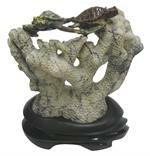 Item #GS-2108: 2.5"x4.5"x2" tall Serpentine Turtle. Item #IGM-CRTR-25: Set of two Carnelian Turtles in matrix the larger of the two being approx. 2"x2.25"x1.5" tall. Item #GS-765: 3 1/4" x 3" x 1 1/4" tall; Dark Blue with Black & White mottling. Item #TPW-5: Natural Onyx colors; 4 x 1 3/4" tall.